Sam Houston State University and Angelina College signed an agreement Wednesday that will make it easier for Angelina College students to transfer to SHSU, and give them joint admission status as well. 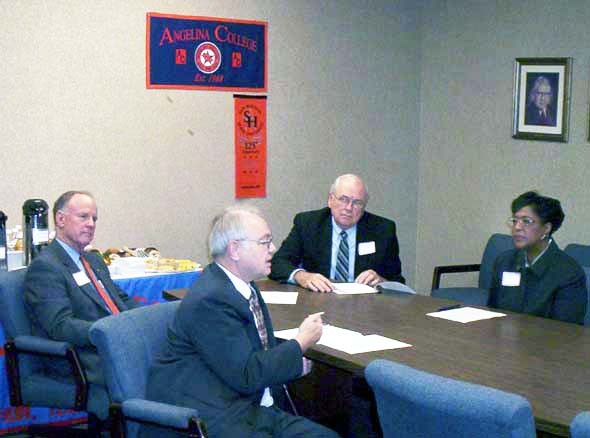 Signing the document, which was similar to ones signed earlier between SHSU and the Blinn and Montgomery College systems, were, from left, James F. Gaertner, SHSU president; David Payne, SHSU provost and vice president for academic affairs; Larry Phillips, Angelina College president, and Patricia McKenzie, Angelina College vice president and dean of instruction. Thanks to a new agreement between Angelina College and Sam Houston State University, the process of transferring from AC to the four-year college will be easier. The agreement will also give students joint admission to both colleges.
" Through this agreement, Angelina College students will be able to access from the home pages of both institutions over 30 articulation agreements for more than 40 different degrees at Angelina College and Sam Houston," a press release from Angelina College stated. "The articulation information will be available online to students and counselors at both schools.
" The program is designed to encourage AC students to complete associate degrees before transferring to Sam Houston for (bachelor's) degrees. In the job market, there is a clear distinction between having attended Angelina College and having graduated from Angelina College." Larry Phillips, president of Angelina College, and James F. Gaertner, president of Sam Houston, are expected to sign an articulation agreement between the two schools on Wednesday. As part of the agreement, students taking advantage of joint admission may attend both schools at the same time. AC students will be allowed to have Sam Houston ID/bank cards with student access to Sam Houston sporting events before they even attend the college. Students will also be able to use a Sam Houston e-mail account with enough space to create and maintain a home page and to store important files from one semester to the next. In addition, students will have access to the Sam Houston library and campus computer facilities while they earn their associate degrees at Angelina College. The two colleges' financial aid departments will work together to make financial aid transfer between the two institutions as convenient as possible for students involved in articulation agreements, the release stated. Students seeking more information about the agreement may contact Patricia McKenzie at Angelina College at 633-5201 or David Burris at Sam Houston at (936) 294-1568. Gary Bass' e-mail address is gbass@coxnews.com. Reprinted with permission from the Lufkin Daily News, Nov. 30, 2004.